Hi, I'm Elena Vinogradova - the teddy bear artist (Russia, Moscow). My profession was the teacher- psychologist, but always my favorite was a home needlework . For a long time I combined work of the methodist-organizer of pre-school education with the handmade creativity. I always was fond of toys create: a textile toys, a folk style out from a clay and then a dolls out of a porcelain. Among creative hobbies were a soft toys too. As a great teddy bear fan, one day I decided to make my own teddy bear. Now the teddys making is my greatest passion! Since year 2003, I created a lot of the teddy bears and friends. I love to invent images, to develop patterns for them, sew, decorate, to painstaking work on the details of clothing and accessories for each of the created characters. Several times during a year I participate in a teddy bear fairs. Previously I participated in a Germany, Sweden, Belgium exhibitions too. Created by me characters "found a home" not only in Russia but also in many other countries. Previously I participated in a teddy bear competitions. 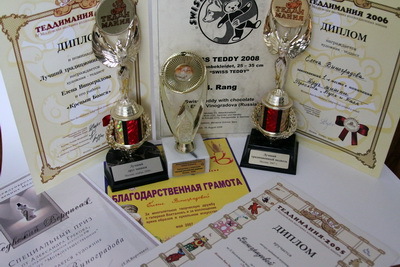 My characters won prizes in the competitions in a various categories ("Best Russian bear" 2009", "Best traditional bear" 2007, "Best Bear Friend " 2006. ). And in February 2009 I held a small Solo exhibition of my teddy bears in the Vahtanov Galery (Moscow, Russia). During 3 years I gave many workshops for a teddy bear beginners makers. But now I don`t have any master classes. The process of teddys creating takes up all my free time (as non free time too ).